The untouchable VIP, developed for the narrow alleys of Chicago, is perfect for areas where space is limited but compaction is required. Because the power unit is on the side of the Untouchable VIP it can be placed almost directly against a back wall. 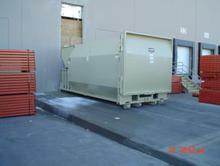 The container is on heavy-duty casters and easily be rolled to an area accessible by waste collection trucks. 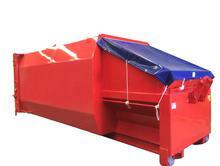 The Untouchable VIP can be configured for front or rear loader collection vehicles. The DRC II is one dual-purpose compactor, occupying one space, with two separate compartments that enable you to compact a wide range of waste and recyclables all at one time. 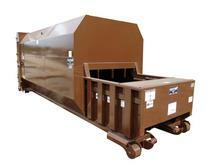 It’s designed for compacting and containing wet or dry waste and simplifying waste dumping. 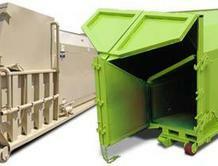 The Pak’ntainer helps maintain a sanitary environment, while saving money, for those generating as little as 20 cubic yards of refuse a week. Place the Pak’ntainer wherever needed, whenever needed — temporarily or permanently — no anchoring, no concrete pad, no special surfaces required. It can be used alone or to “fill the gap” in combination with other units. The container is tapered to achieve superior compaction ratios and aid waste ejection, which eliminates excessive wear and tear on collection trucks. Liquid-tight construction helps ensure a sanitary environment. The drain enables water to be removed, lowering disposal costs. The RJ-250 units are state-of-the-art in roll-off self-contained compactors, featuring oversized feed openings and expanded container storage capacity. They are designed to store and transport your waste, prevent contamination of public areas in accordance with public health department requirements, improve working conditions for your employees, and reduce disposal costs. 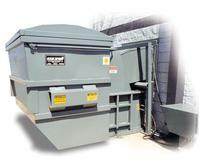 The RJ-88 Self-contained compactor/container is ideal for waste with high liquid content. Each RJ-88 stores liquid and helps control insects and odor problems. Each container is factory tested and certified to be free from leaks. With standard double-end pickup, the RJ-88 can be loaded for hauling from either end. This is especially useful if installed perpendicular to a dock. 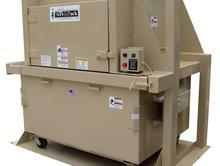 The compactor is built into the same door through which the compacted refuse is later emptied, eliminating the need for the additional space needed for the time-consuming double “turn-around” maneuver required for conventional self-contained models. The Self-Contained Auger is ideal for wet waste such as organic material and medical waste, and with a displacement rate of 305 cubic yards of material, and an auger that always moves forward, you can be confident that your machine will run on time every time.